The new materials you need to teach the last eight lessons of Essentials! 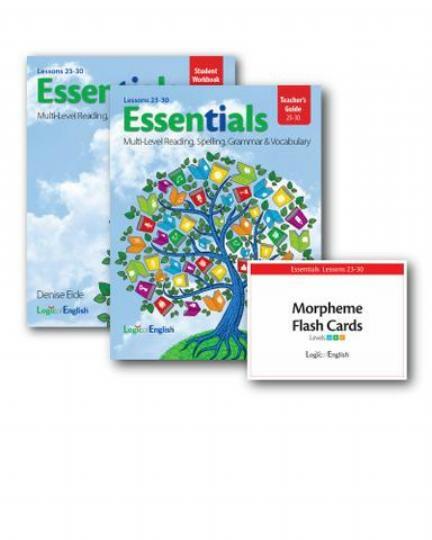 In the last eight lessons of Essentials, students learn the remaining phonograms and spelling rules and apply these concepts, as well as those from previous Essentials lessons, to increasingly complex words. In addition, they learn advanced phonograms, new grammar concepts, new morphemes, and linguistic concepts that shape our spelling and pronunciation such as assimilation of sounds and "shades of sound" - the way sounds in a language can change shape in different sound contexts. -Three levels of application within each lesson allow you to customize the level of difficulty in order to provide the right level of challenge for each student as you go. You will also need the reusable supplements used throughout Essentials, found in the Essentials 1-7 Complete Set (or sold previously in the Essentials Volume 1 Complete Set). The Essentials 23-30 Set is designed for those who have already completed Essentials Lessons 1-22. Continue to these lessons when you complete Lesson 22, using the same level spelling list and practice activities the student was using in previous lessons. After you complete Lesson 30, if your student was using the Level A or Level B spelling list, you can repeat the entire curriculum, starting at Lesson 1, moving up to a more advanced level. The second time through, you'll review all the basic concepts more quickly while focusing on applying them to more advanced spelling words and learning new morphemes.